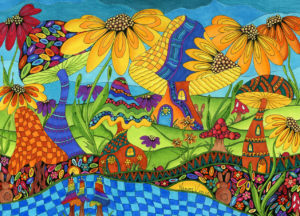 Join Nancy Vince and create happy doodle art. In this class she will show the progression of creating a piece from the pencil sketch to the finished artwork. Begin by creating your ideas in pencil, then use a pen to work in the details, and lastly add color to the art piece you create. She will demonstrate some of the Copic Marker shading techniques and products she uses to create her artwork in addition to showing what you can do with the art you create. Price includes all materials.